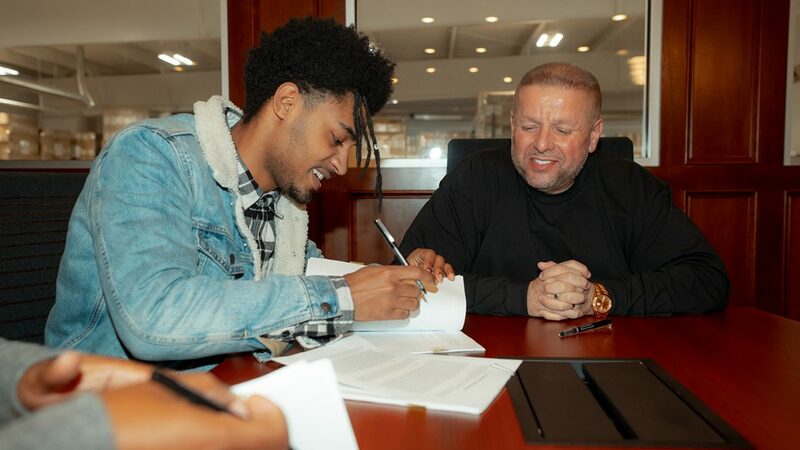 Strange Music Signs New Artist Maez301! Tech N9ne’s Strange Music has signed rising rapper Maez301. The Maryland-raised, Los Angeles-based artist is set to release his EP in April, the first round of songs that will announce music’s next juggernaut. Maez301 independently released his Nowhere project at the end of 2017. It caught the attention of Strange Music. From there, Maez301 appeared on “Unbreakable” and “Tremble,” two stellar selections from Big Scoob’s 2018 LP, Duality. Impressed by his character and his work ethic, Strange Music signed Maez301, paving the way for the company’s next superstar, one whose musical aspirations and talents are vast. Now as the newest artist inked to Strange Music, Maez301 wants his music to establish him as a superstar whose reach goes beyond his art. “My goals far supersede anything in music and entertainment,” Maez301 says. “It’s about just being positive and positively affecting other people’s lives before I got the deal and long after. I’m definitely trying to positively affect other people’s lives through my work and my character.” With his brand of revolutionary music about to reach the masses, Maez301 is well on his way. Welcome to the family Maez301! Its been a heck of a journey from my moms basement to the boss of strange musics office, but Gods been working overtime and I want to thank him first and foremost for all thats being worked into my experience.4 as long as I can remember Ive believed I had a higher purpose n this life, and with this signing is proof that i wasnt crazy. Many nights I’d expound upon my dreams with my close friends and family and to them it all sounded alittle 2 good 2 b true. As I continued on my journey 2 achieving my dreams I began 2 learn that the exterior work was only a small part of the battle, who I was on the inside was the most important work. As I focused on fine tuning my spirit blessing began to attract themselves to me. Thank u to my parents for betting on me 1st always teaching me loving me and reminding me of my potential. Thank u mom and dad 4 giving me the opportunity to figure myself out and cultivate myself as an artist but more importantly as a man. Thank u @Epmusic and the entire Pope family 4 believing in me and taking a risk, providing for me when u didn’t have to and dealing with the difficulties of looking after a yung punk like me I will 4ever b grateful❤️@inglewoodmugs man What can I say? Its like I never left home lol u remind me of my pops, big n scary looking but Truly loving and virtuous. U made sure I understood the essentials of the business of music. U made sure I was always being a good human being, and u made sure I always understood the value of patience(#bestill).u didn’t just do these things by talking to me, but by showing me and I truly appreciate your existence in my life. Then theres @therealtechn9ne ! I still cant believe how it all unfolded, and to know u where truly a fan of my work, vouching 4 my opportunity to be a part of your conglomerate, I am 4ever grateful! Lastly @strangemusicceo and Strange music! U took a chance on a guy with no fanbase, no followers, and no real numbers in terms of plays or streams. But Here I am.u guys took a bet on talent and gave me a shot most wud never c.U guys are y I am and Im so grateful to have u all in my corner. To God be the glory.Its no looking back now!Its time to GET EM! full video n my bio!